I’m super excited because I am going back to interview my friend from Podcaster’s Paradise in episode #1 that he had to record back then, I was listening earlier but it’s pretty fun, and still full of golden seeds… one thing I was gonna tell listeners if you want to go back and listen to it I think you have to go to my website and download it, it’s not available on iTunes anymore…. That’s me, I always find the good in people, I’m like the eternal optimist! 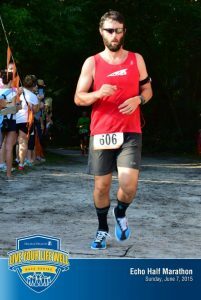 my degree in athletic training… injury prevention/recovery. Variety as always important… if you’re always eating the same couple of things, you’re not getting the variety of nutrients… try to add…some variety as well will help! Cool i like that! Do you want to tell us? Did you grow a garden?! I know youre super busy. Don’t you even have a book coming out?! I’m working on a book. The entrepreneur’s curse! Always doing something. I have bene busy! The podcast is up over 350 episodes now! And coaching runners…! Doing that! Doing the garden and working on the book! I was composting for a bit, that was going all right! and in the last year and half or so…. 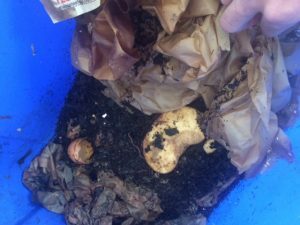 I’ve gotten into the vermiculture where you’re using worms to compost for you! And that’s been going really good! every 3 months or so I put some fresh worm castings on to the soil and add more mulch, improve with cover crops, picking tomatoes yesterday. tomatoes taste good! That’s half the battle. It’s exciting to watch that improve and see the produce! So you put the worms in a canvas bag? A tote? No like a plastic tote, bucket that you store stuff in?! Did you say you change it every 3 months? Any climate zone as long as you keep em moist and cool and warm in the winter your good! I’ll be like I got us a class pet! I got us 100 worms! I just made that up… what size do they come in? steady stream of food products… it sounds like you have a steady stream! The kids are like let’s get a rbbit… I’m not good with a pet, I can’t keep it in the cage… then I’ll want to let it go and then it’s trouble! throwing, scrap paper! We have lots of that! The kids go through some paper too! I ahve bins and bins of triangles.. I think I have papers from 2007 at Head Start I kid you not. They’ll be like Jackie finally cleaned up her clutter! Cool solving two problems at once! 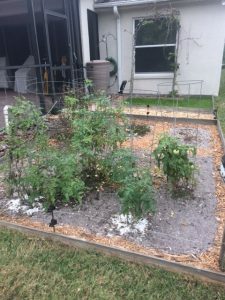 I was thinking that might be good for the 2017 garden challenge… maybe I’ll try to do that and mike cna do the big all out garden mini-farm I’ll be in charge of our food that we are gonna eat and he’ll grow for market…. If I get the second round of tomatoes by Valentine’s Day … middle of May it’s just too hot and rainy and the bugs are too crazy …. root rot because of rain … some basil and some mint …. experimenting with different thing … sunflowers this year for the first time, it was almost like a buffer on the back of the screen porch….nice to have something to look at …. big yellow background! Trying to figure out some fruit. I’ve tried the blueberries, I think, I need a different variety. foolishly bought them at Lowes or Home Depot to think we’d get something for Florida. but we didn’t…. If push came to shove I’m more of fruit then a vegetable guy! They grow in the heat so let’s give them a try! My mom has a fig tree… They kind of remind me of a cross between a pear and a kiwi, no fuzz but yummy totally different then the dried fruit. get a good healthy plant… from a local nursery. Well you’ll get it done at the right time. Organifi Green Juice is a gently dried superfood mix that supports health and mental clarity, while detoxifying your body all in one delicious drink! easy and doesn’t take much time! As a teacher, you all know my time is limited, I have kids in my room from 7:#0 in the morning till 6pm at night so if I can pull it off you can too! And Organic Gardener Podcast listeners Organifi will give you a 15% discount if you enter code OGP16 to get a 15% discount at checkout that’s Organifi.com code OGP16 at checkout for 15% off your order anytime! Denny are you ready to get to the root of things? I can totally relate to that Im lucky if I make to the middle of the seas on. you start the water or pan to cook and go out and throw it right in… from garden to pan in less then 2 minutes! Enjoying the spoils of your labor! always stuck with me since I had my own garden. and stay out of the way…it’s easy it’s quick not a whole lot of mess…. that’s my go to quick and easy! A favorite reading material-book, mag you can recommend? Good for you’re mind, body, and soul so keep it up! coaching…through the podcast and blog and emails … is help people to do that…. Social media… it’s gonna be me…there’s no other imposters…. You can find me at the Diz Runs Tribe on Facebook! lots of fun, lots of support. whether your new to running or a Boston qualifier! We have a good time. It’s not just for Florida!